Before I get going, I'd just like to say thank you for all the comments and new followers of late! I am honored and humbled by your kindness! It's that Funkie time of the fortnight...already! Over at Frilly & Funkie, the challenge is being hosted by the famous Linda Coughlin of The Funkie Junkie. Linda wants to see "The Great Outdoors". The heat of the summer is starting to break here in the States. 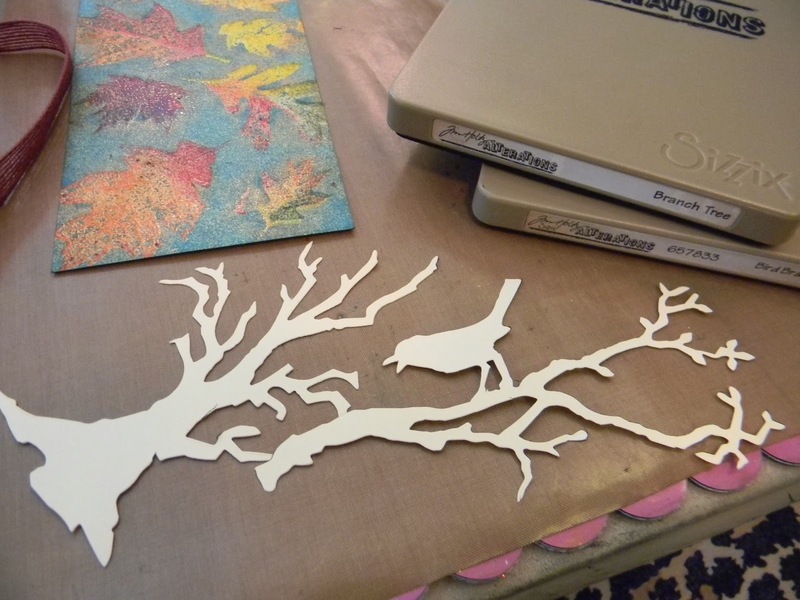 Let's celebrate being able to get outside to enjoy the fresh air by making something with an outdoors theme. However, there is a required ingredient that you must include... a quote about the outdoors or nature. Take a refreshing look at what all the other Design Team has created for this challenge. The challenge for Compendium of Curiosities II Challenge this week was Enameled Stamping, from pg. 44 of Tim's book by the same name. 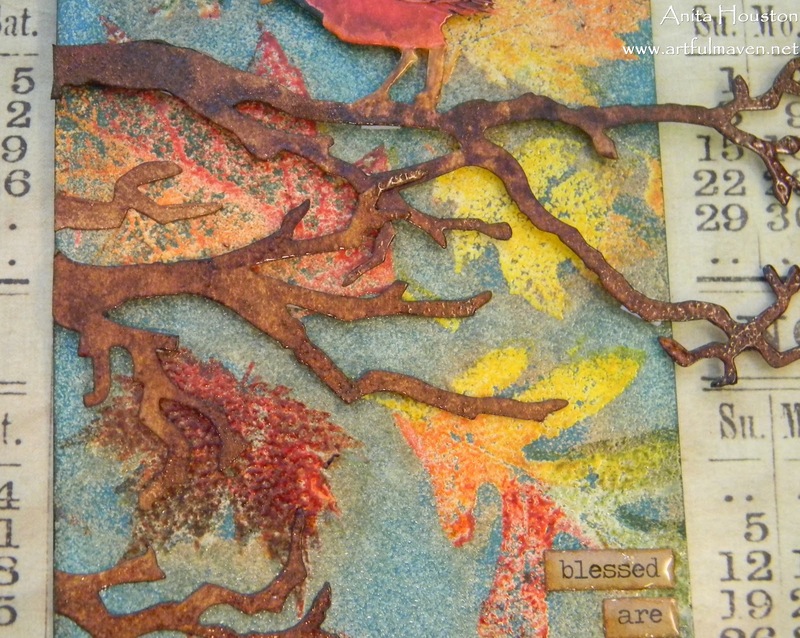 I love this technique for it's amazing textural effects, but I didn't have a background stamp that I wanted to use, so I made my own...of sorts. 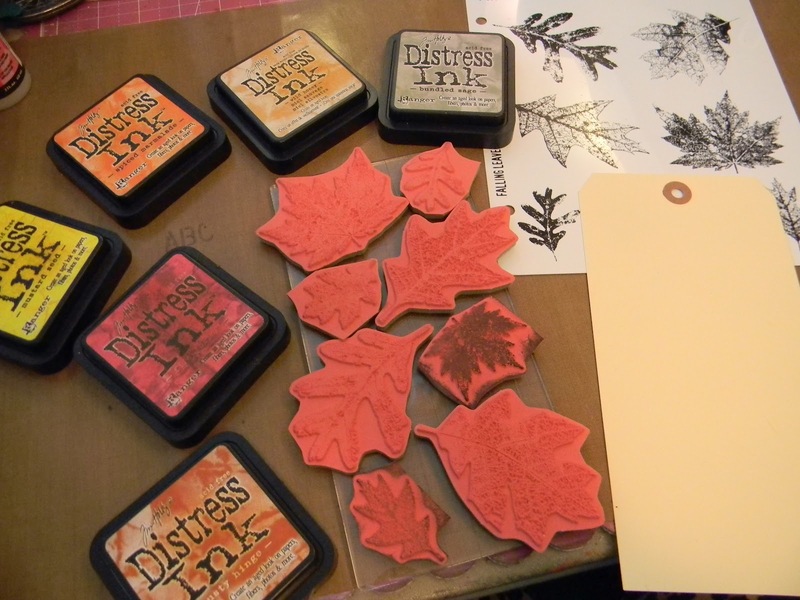 I used lots of colors of Distress Ink and even more leaves. Here is my jumbo tag after Tim's technique. I wish my photo could really show how gorgeous this is. The color, shine, and texture are fabulous...not bragging on me, only the technique! I did not want to cover this up. In fact, I stared at it for quite some time debating what to do. I almost stuck a ribbon on it and called it good, but I at last decided a little nature would be good. I used Manila to die cut the Branch and Tree. 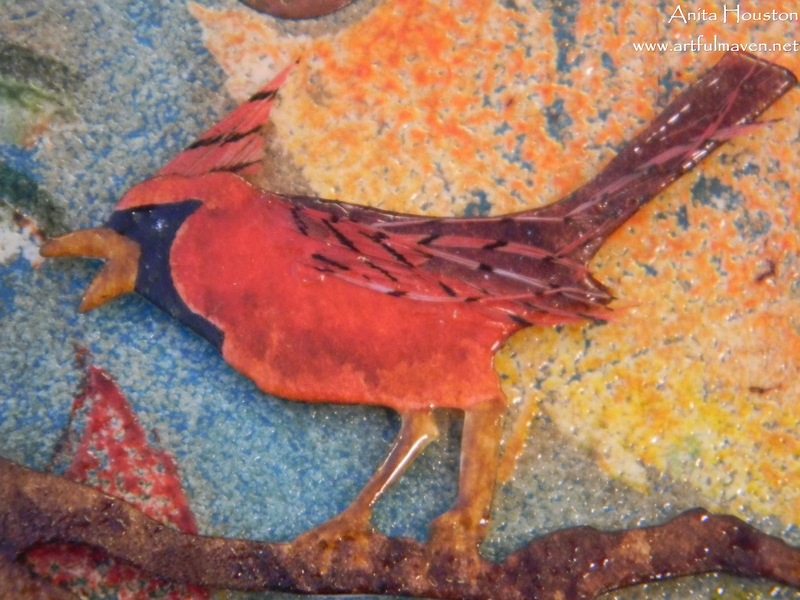 I used Stain to color the wood portions and the bright red on the cardinal. 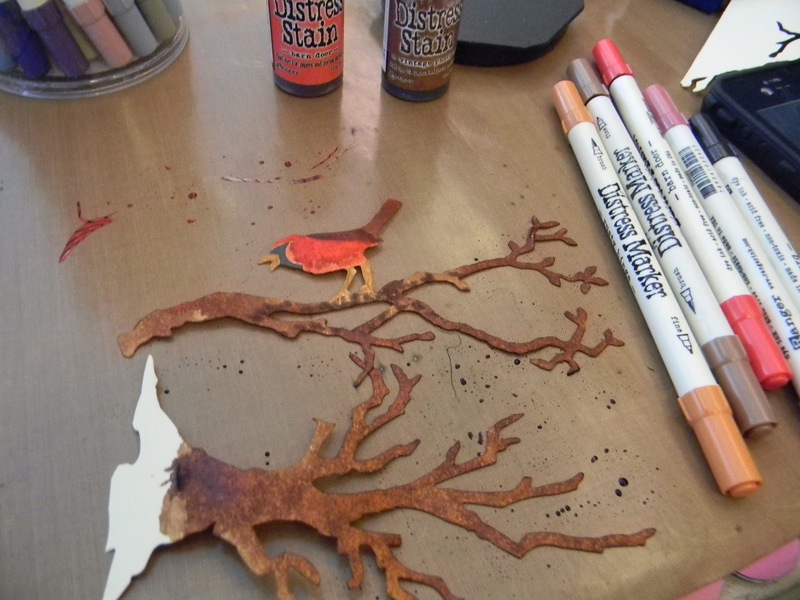 I finished up the cardinal with Distress Markers and some real feathers. 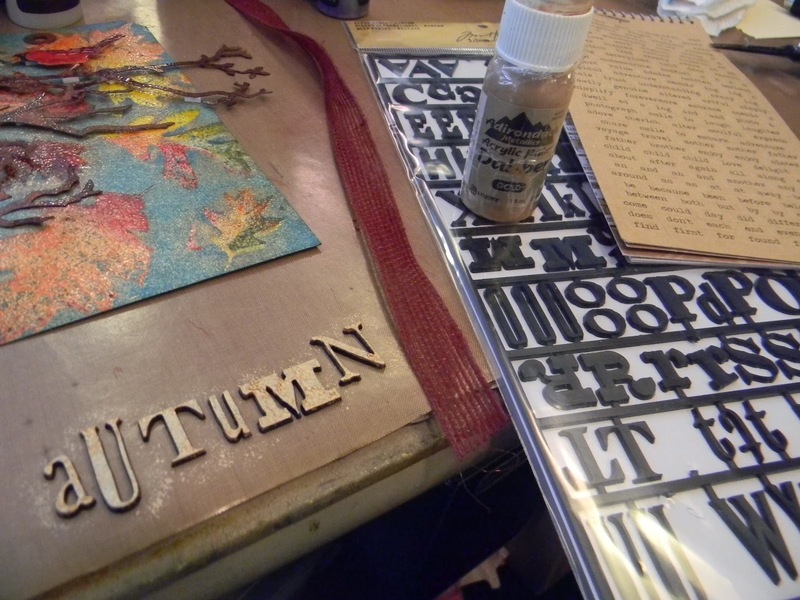 Everything got a coat of Embossing Powder. 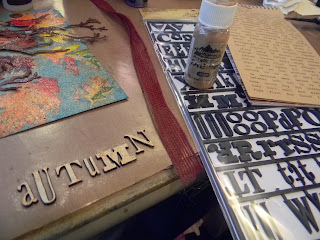 Some Tim letters received Gold Paint Dabber and Chit Chat letters Glossy Accents. 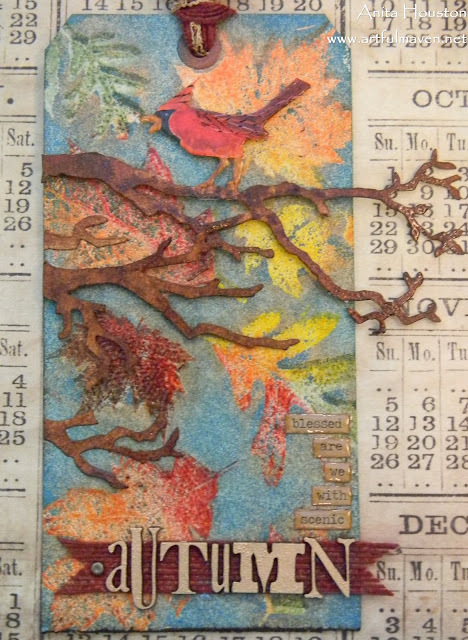 Aside from CCIIC, I am submitting this to the Sunday Stamper challenge for "A Riot Of Color". Burgandy Woven Jute Ribbon 5/8"
Anita you strike me at the heart! Completely stunning, the background really is gorgeous. 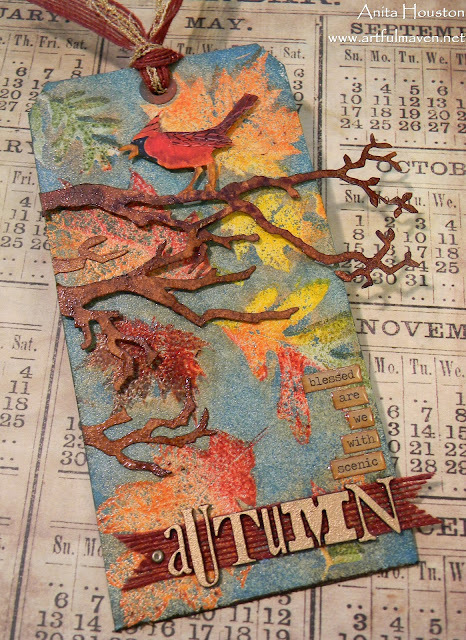 A great autumn tag Anita..it looks amazing. 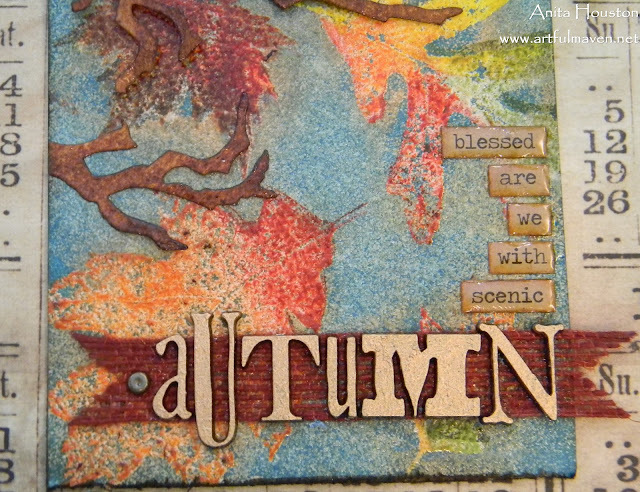 That's a gorgeous tag, the background is breathtaking and the die cuts are perfect for it. Love every little thing about your tag, Anita. Fabulous colors on the leaves. I think I too would have been hard-pressed to cover up all of that loveliness! Love it! Autumn is my favourite season and you've captured it beautifully. The background collage of leaves is so realistic I can hear them crackling. Love the cardinal and branch. They add another layer of beauty...and those feathers, great detail. The quote in all its glossiness and gold is the perfect finishing touch. I love the whole tag! But that background is absolutely stunning. I don't blame you for not wanting to cover it up. Love this! The colors on your leaves are just gorgeous! And I love how you fashioned the cardinal! 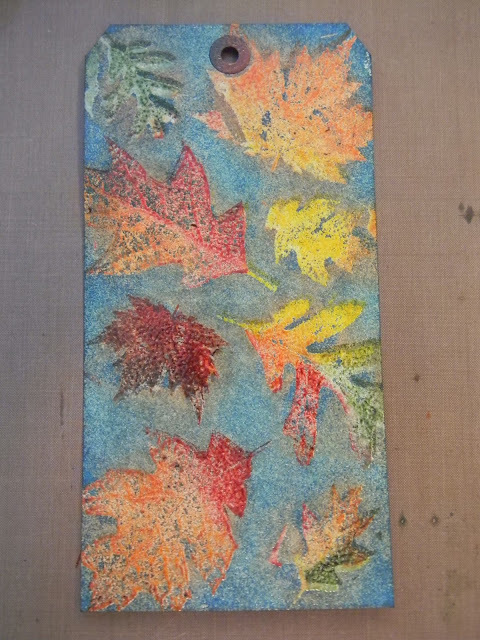 It is so amazing colours foliages,and all tag is very beautiful! This tag is beautiful, Anita! I love the leaves, such a great idea! Love how you used the leaves for the background! 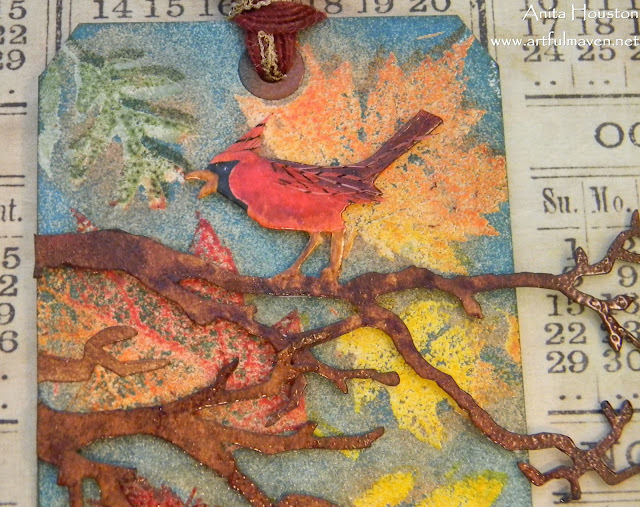 Very nice Fall tag and how cool is that Cardinal? Fabulous! How glorious! Love your awesome leaves. the colored letters, and the sweet banner you used to ground them. Your background is super! Love the feeling this tag evokes--fall is my favorite season! But I can't get outdoors much quite yet--seasonal allergies have overtaken my life, this year for the first time! Never thought I'd look forward to the first "killing frost." Your projects always wow me! Gorgeous tag Anita! Love the autumn theme and colors, it's beautiful! Absolutely luscious - full of the glories of Autumn, and sensational technical creativity... the leaves are utterly to die for!! Ooh look - we coordinated commenting... just got back from leaving one here to find yours waiting for me!! Fabulous tag!! I love the colors and textures so much!! thnx for sharing!! Super gorgeous. What a wonderful background! !Thanks for the step by step. love the tag Anita! Really great color choices for the leaves and background. Love it. 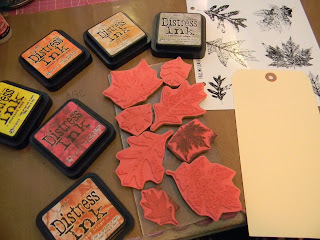 Beautiful tag, love the way you used the leaves for your background stamp. I'm loving the colors and all the detail. What do you do with all your creations anyway?? Your so good and you make things so quick. Just awesome!!! Great tag! I love the colours and the nature you put on top. I didn't want to cover mine either! I've regained consciousness!! But seriously, what??? I go from one incredible creation to another. I'm like 3 gallons of motivation shoved into a 2 gallon jug..I'm about to explode! Thank you so much for the explicatives of WOW I've experienced on your blog. :) This tag is the essence of my favorite season!! !